For the first in our series of expat interviews, we talk to Alan, a British expat living off-the-grid in southern Spain. Easy question to start! Tell us a bit about yourself. Hi there, and thank you for having me as your featured expat interviewee. My name is Alan Parks, and I moved to the Cordoba Province, in Andalucia, Spain in January 2008. My partner Lorna and I used to live in Brighton in the UK. We had an amazing house on the edge of a cliff top with 180 degree sea views. Now we are surrounded by olive trees. Why did you move to Spain? Lorna used to be a dance teacher in the UK, but she developed a condition called Sarcoidosis, which made dancing difficult. One day she said to me “I don’t know how much longer I can carry on doing this.” Things went from there, and we ended up buying a renovated olive mill in the hills of the Sierra Morena and we breed alpacas. We have a small herd of 8 alpacas and our plan was to breed them, and sell them on make a living. Of course, then the crisis came along and things have had to change. We also live totally off grid, relying on solar power for electricity and our water comes from a spring in the hillside. What is the best thing about where you live now? The outdoor lifestyle and 9 months a year of sunshine and blue skies. We also very much like the atmosphere of our nearest town, Montoro, which is a bit like living in the UK thirty years ago. Children can safely play in the street and health and safety is a bit laughable. What (if anything) do you miss about home? Well obviously Lorna misses her children, and she now has three grandchildren so that can be hard. For me, sometimes I miss how easy things are in the UK. If you want a plumber phone a plumber, they come to your house and fix the problem. Here in Spain, it may take four different people two weeks to fix that problem BUT those people might invite you to their house for dinner and not charge you for fixing the problem. Some days I wish I could order a take-away or pop to the chippie. I also miss playing football with my mates, and visiting the cinema. If you could change one thing about where you live, what would it be? Winter can be hard going. So far in 2014 we have had only 2 days of sun, so we have been struggling for solar power. The washing is building up and we are recycling clothes. Plus, it gets very cold where we live. People just don’t understand how cold these houses are when the weather is bad. We have no heating, no carpets and stone walls. Sometimes you just prefer to stay in bed where it is nice and warm. Do you plan on moving again in the future? If so, where and why. Actually yes. Although selling houses in Spain is difficult right now. We need to move to a property with better land for our alpacas. We came to Spain to build a business with these beautiful animals, and we haven’t been able to do that. Circumstances and finances have conspired against us. What has been the most difficult aspect of moving abroad? The hardest part has probably been the financial crisis. That has affected our plans and we have had to borrow money to survive. Of course there is also the emotional aspect of living so far away from family, especially when things go wrong, either for them or for us. And finally, please share your top three tips for people thinking about moving to Spain. My advice for people moving to Spain would be to try and learn the language first, even just the basics. Also, I think it is important to try not to immerse yourself in ‘expatland’. Real Spain and Spaniards are amazing, get to know them. Lastly, not just about Spain, but my favourite piece of advice is to live life for today. You might get run over by a bus tomorrow, why wait? I am Alan Parks, and my partner Lorna and I moved to Cordoba, Spain in 2008. I worked in retail for 13 years before being made redundant. I lost my Dad very young to cancer and through that, I decided that I didn’t want to just live life in a normal way. When the opportunity came up to move to Spain, it was too exciting an opportunity to miss out on. 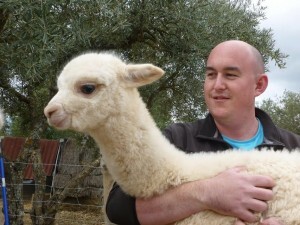 I have now raised alpacas from birth to adulthood, and written two books about our life here at the Olive Mill. The first one is called Seriously Mum, What’s an Alpaca? and the follow up is Seriously Mum, Where’s that Donkey? You can find my books on Amazon and follow my blog at http://whats-an-alpaca.com. Previous story Moving to Ecuador? New expat guide launched! i ‘met’ Alan thru a facebook group after reading his first book. It is a great read and I highly recommend it. You get a great look into their world. He and Lorna are two indomitable spirits and I hope to meet them in person one day! A great interview and some good advice to those taking the plunge. Alan’s two books are very good, funny, sometimes sad but never boring.